Can Lady Jane Grey be Known as Queen Jane? Lady Jane Grey is commonly known as the Nine Day Queen but is never called Queen Jane? Should she be known as Queen Jane or is there a reason that will never happen? When going through the Tudor dynasty, it is really easy to forget one monarch: Lady Jane Grey. It isn’t just the fact that she was only Queen of England for 13 days but it’s more the fact that she is never called Queen Jane. Most of history only calls her Lady Jane Grey so it begs the question as to whether she was really a queen. Jane Grey was just 16-years-old when she was made Queen of England. It wasn’t something that she wanted or thought that would happen. She was fourth in line for the throne, behind Edward VI’s half-sisters, Mary and Elizabeth Tudor, and her mother, Frances Brandon. She probably didn’t expect to be Queen of England, believing that Mary or Elizabeth would have children of their own. The problem for Jane was Edward VI. He didn’t want his sister to become the next queen. He didn’t want the country to become Catholic again and he didn’t believe women could rule. Jane was chosen as his next in line. Why Jane? There were no males apart from in the Scottish line of the family and Jane was more likely to have the male heir. While Elizabeth was still young enough to have children, she was illegitimate and Edward and the government likely feared that England would not accept her as the new monarch. Jane Grey was also married to Guildford Dudley, the fourth son of Lord Dudley and Edward’s Lord Protector. He saw the chance for more power and helped to convince Kind Edward to place his daughter-in-law on the throne. He likely saw it as a chance for his son to become King of England, which didn’t and wouldn’t likely have happened! Even though she declared herself as Queen Jane in writings, she is never known as Queen Jane. Historians view her as the woman who usurped the throne unsuccessfully. The English people never saw her as queen and supported Lady Mary’s fight for the crown. The people received the news of Queen Jane on the 10th with bitterness. She never had a public coronation either. This technically meant that she had never been crowned as Queen of England and, therefore, never held the title. She was proclaimed Queen but without the coronation nothing was official. When Lady Jane Grey was tried for treason, pieces of evidence brought before her were documents that had been signed as ‘Jane the Queen’. She was found guilty of pretending to be queen, which was a treasonous act. This makes it clear that she simply cannot be known as a queen otherwise it wouldn’t have been treasonous! Interestingly enough, those are the only pieces of evidence against Jane and condemned her to death. If it was just the lack of coronation, it isn’t really a good reason. Before Jane, there was one King of England who never had a coronation; the young King Edward V. His memorial plaque reads King Edward V, despite being declared illegitimate before his coronation, leading to the proclamation and coronation of King Richard III of England. Edward V is known as one of the Princes in the Tower despite being a King at the time, which is very interesting. There was another King of England after Jane who was never crowned officially but is known as a king: Edward VIII. Edward VIII chose to abdicate the throne in 1936 shortly after the death of his father, George V. It led to George VI becoming King of England, leading to Elizabeth II taking the throne in 1952 upon her father’s death. If that is the case, Jane Grey is definitely Queen Jane. She was proclaimed as Queen of England on July 10, 1553 and deposed by Mary I just nine days later. She was King Edward VI’s choice on his deathbed. It would make sense that she should be known as Queen Jane. She is, after all, known as the Nine Day Queen. Yet, her ‘reign’ is still often written just like that – in inverted commas since it wasn’t technically a reign. It seems strange that she isn’t known as Queen Jane and isn’t officially classed as a queen but is known as the Nine Day Queen—the opposite of Edward V! The only reason she was deposed was because Mary Tudor had the support. Most of the support came from the fact that the English people loved her mother. They didn’t know what type of queen she would make and whether Jane would do a better job. The English people simply saw Jane as an imposter; a usurper not fit for the throne. It was only after Mary’s first year that Lady Jane Grey became a threat. There were many rebellions against Mary’s actions as Queen of England. Mary was guilty of persecutions and difficult decisions to turn the country back into the Catholic one that it was. One of the rebellions involved Jane Grey’s father, Henry Grey. 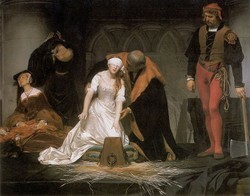 When he was captured, Mary I realised that her cousin was a threat and Lady Jane Grey and her husband were executed. It would be interesting to know if the people would have supported Jane had they known the type of queen Mary would be. But that would be for another time. She isn’t classed as the first monarch to be executed—that title belongs to Charles I—making it clear that she still isn’t classed as a queen. Poor Lady Jane Grey never wanted to be Queen of England and arguably she never was. She was seen as an usurper and a failed one at that. The English people always saw Mary I as the true and rightful queen. It simply didn’t matter what Edward VI wanted or thought was best for the country. The lack of coronation isn’t enough to stop her from being known as Queen Jane—a king before her had already been called King of England without a coronation. It was the evidence used against her that makes it clear, despite being proclaimed queen, she will always be Lady Jane Grey and never Queen Jane.